Girls from Church in Ganado, Arizona, take High School Basketball State Championship! Sammie and Sandy Begay, Ganado, Arizona, Navajo Nation, can now boast of basketball fame. 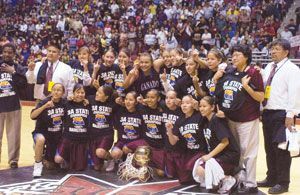 Their daughter, Suzanne, and several other girls from Ganado Glory Temple, were on the high school basketball team that won the State championship! !